Much research on workplace injuries and deaths has focused on accidents such as falls or electrocutions. But a recent study of firefighters who died on the job from cardiovascular problems addresses the impact of sudden bursts of physically strenuous activity. The study’s findings were based on data from the National Institute for Occupational Safety and Health involving the deaths of 199 on-duty firefighters from cardiovascular events between 1998 and 2012. Of the deaths, 167 were caused by heart attacks, 12 by irregular heartbeat, three by strokes and the remainder by other cardiovascular causes. Most of the firefighters were young; the average age of the firefighters who succumbed was 49. The researchers looked at the activities that the firefighters were performing before they suffered a cardiac event and classified them as “light” or “vigorous.” Light activities included getting out of a vehicle or driving, while vigorous activities included rescuing someone from an emergency situation and running. In 148 deaths, the firefighters had engaged in vigorous activity of about 33 minutes on average. In 88 cases, the firefighters were actively involved in fighting fires, a hugely strenuous activity. In 61 deaths, firefighters were responding to an emergency. Although the study involved only firefighters, it is likely that sudden bursts of physical activity or heavy labor may also endanger workers in other industries. Of particular interest are emergency workers like paramedics and rescue service personnel. These workers may be required to engage in sudden bursts of activity that are not just physically strenuous but also mentally stressful. The researchers recommend regular health checkups and monitoring for risk factors for workers who are required to perform heavy physical activity or suddenly engage in physically hectic activity. These workers need to be regularly evaluated for their cholesterol and sugar levels as well as their blood pressure. Being physically fit is extremely important for workers who are exposed to sudden bursts of physical and mental stress. 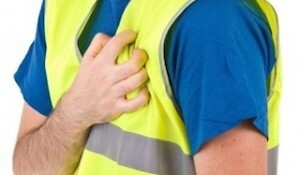 Good general health can reduce a worker’s risk of a medical emergency.